Find here the best hamster bedding available on the market right now, without having to go through our research, should you be pressed for time. After we looked closely at all the critically-acclaimed products and examined the sales numbers and reactions from buyers, we discovered that the Kaytee Clean & Cozy is the product you should get for your little furry friend. While providing your pet with a clean environment, it keeps dust to a minimum, making it easy for you to clean the cage as often as needed. Due to its odor absorption power, it is preferred by many hamster parents, as it doesn’t allow nasty smells to escape or make the little critters ill. It can also absorb six times its weight in liquid, so it is a pretty solid product that will never let you down. In case you cannot find this type of hamster bedding anymore, we suggest the Small Pet Select Unbleached White, as the immediate alternative. Everything you need in a product of this type, you will find in the Kaytee Clean & Cozy. Just as its name indicates, it provides a clean and comfortable environment for your pet hamster. It is capable of retaining a lot of liquid, and it also does a great job at preventing odor from becoming a problem. That means that you will not have to clean it too often, and your hamster will be well catered for in this regard. The consistency of the product seems to be uneven from one bag to another. Excellent product that prevents nasty smells and waste from becoming a problem. The fact that this product comes in white helps pet owners identify easily messy spots for regular cleaning. Because it is 99% dust-free, it is an excellent choice for hamsters. Also, the bedding won’t make a mess, and you will find cleaning a breeze. Only virgin fiber is used for making the bedding, and you don’t have to worry about recycled inked paper being sold as this type of product for pets. It is also free of sludge. Some buyers comment on the fact that this product tends to be a bit expensive. Premium bedding for your hamster, made from virgin fiber, not recycled paper. You can get this type of bedding for a larger cage in case you don’t need it only for hamsters. The thing is that you get a lot for the price, and you will not have to replenish your stock too often. Because it absorbs moisture very well, it is highly indicated for busy people who cannot clean their pets’ cage every day. It is important to mention that the hemp used for the bedding is grown without any pesticides or toxic compounds. There will be some dust when cleaning the cage, so people with allergies should be aware. A natural type of bedding that offers great moisture absorbing properties. When you take care of pets, you have the responsibility to ensure the best living conditions possible. That is why we took a close look at the hamster bedding reviews written by users and experts and identified the models that are the most popular right now, due to their outstanding properties. If you’re looking for hamster paper bedding that offers superior advantages both to the pets and the owners, know that the Kaytee Clean & Cozy is on top of the list. First things first, this product ensures proper odor control, which means that you won’t have to worry about nasty smells escaping the hamsters’ cage. It is vital to know that this bedding is safe for your hamster and it doesn’t pose the same issues as wood shavings. Furthermore, it absorbs moisture twice better than the latter, so you will notice a serious improvement in how your pet’s cage looks, and how often the bedding has to be changed. As it is almost entirely dust-free, you will be pleased to see that cleaning the pet’s cage takes less time and it’s less messy. Also, should you suffer from allergies, not having to deal with any dust will have certain advantages for your health, as well. This bedding is so soft and cozy that your pet will love burrowing and nesting in it, which is an added plus. Due to its superior odor control, it doesn’t need changing too often, offering extra convenience for pet owners, as well. It is 99.9% dust-free, which means that people with allergies won’t have a hard time cleaning their pets’ cages if they are using this bedding. The excellent absorbency rate, which is six times its weight, is another crucial aspect that makes this particular bedding a superior choice. Buyers can choose from a wide range of colors and scents, and the bedding is made in the US, thus abiding by high-quality standards. Buyers comment on the fact that the consistency of the bedding varies, something being fluffy, sometimes being similar to long strands of shredded paper, which their pets might not like. There are many advantages of using this type of bedding for your hamster’s cage. First of all, because it is white, it allows you to see piles of waste and brown spots easily so that you can scoop up the dirty parts without changing the entire bedding. The second thing that is worth noting about this product is that it is made from virgin fiber. That means that no recycled paper is used in its manufacturing process; the immediate benefit is that there will be no residues of ink and other chemical compounds to worry about. Another aspect that makes this product a good hamster bedding choice is that it is 99% dust-free. Your pets will thrive in an environment that is good for them while you will be thankful for not having to inhale dust when you’re changing the bedding as regular maintenance. You don’t have to worry about sludge or ink contaminating the environment inside your pet’s cage since it is made from virgin fiber, and not recycled paper, like other types of bedding. Its softness makes it comfortable for pets to burrow or nest in it, something that rodents like doing. As far as dust is concerned, you don’t have to worry about a thing since this bedding is 99% dust-free and safe for you, as the owner, as well. The bedding comes in compressed form, and it expands from 16L to 56L, which means that you get quite a bit for your money. Since it’s white, you will have no troubles spotting piles of waste or dirty areas, so that you can quickly remove them, and maintain a healthy and clean environment for your pet. For the quantity offered, this product seems to be a bit expensive, especially when compared to similar brands on the market. One of the most important aspects of this bedding for hamsters is the impressive quantity you will receive for the price paid. The bag you will receive weighs 31 pounds and will expand to 300L, which is plenty of bedding to cover a large coop, up to 50 square feet, with 1.5 inches of content. That gives you an idea about the good deal you will make if you decide to buy this product. Choose this instead of pine shavings, as it can absorb much more moisture, and it also has a pleasant scent. Furthermore, when you clean your pet’s cage and want to throw it away, you can just as well put it in an organic waste container for making compost. Since it is made from hemp, it is a natural product. The hemp used for this bedding is grown without the use of pesticides and other similar compounds that can affect your hamster’s health. If you choose this product, know that it is made from natural hemp, grown in the best conditions possible, without the use of chemicals. You will make a good deal since each bag of product weighs 31 pounds, but expands to 300L, which is plenty of bedding for a long time. After you finish using the bedding, you can throw it into a compost bin, and expand its uses by turning it into fertilizer for your garden. The bedding is suitable for many different rodents; besides hamsters, you can use the bedding for rabbits, guinea pigs, and gerbils. It does a great job absorbing moisture so that you don’t have to clean your pet’s cage too often, which is an extra advantage. This bedding will generate some dust when you’re cleaning the cage, according to some pet owners who have already tried this brand. Rodents will like this type of bedding, as it is made with their specific needs in mind. As paper bedding, it is an excellent option for guinea pigs, hamsters, as well as other small species of animals. Because it is soft, it is cozy and pleasant for hamsters and allows the tiny critters to burrow and nest in it as they like. The bedding is compressed when delivered and will expand at three times the initial size, so you can rest assured that you are making a good deal. Its absorbency rate is good, and you will notice that once you start putting the bedding inside the pet’s cage, you will have to change it less often than before. It is essential to note that this paper bedding is safe for your hamster. The paper used for making it is unbleached, and never printed, so there are no dangerous residues left that could affect your pet’s health. Your pet’s comfort matters, and that’s why it is great to see a type of bedding like this one that caters to the wellbeing of these critters in such a manner. Rodents like hamsters, guinea pigs, and rabbits will find this bedding to be to their liking so that you can buy the same brand for all the pets you have in your care. The bedding expands to three times its initial size, as it is sold compressed, thus ensuring that you are getting quite a good deal for the money. Unbleached, never printed paper is used for making this bedding, which is great to know, seeing how small animals can be affected by the chemicals used in printing. It is worth noting that the product is made in the US, to the highest standards of quality. There seems to be an issue with odor absorption, and you will have to clean your pet’s cage more often to keep the bad smells away. What you need most and foremost in your pet’s bedding is proper odor control, and that’s precisely what this product offers. Also, it is 99.9% dust-free, something that can’t be said about many similar products on the market. If you are a person with allergies, you can surely appreciate the fact that changing the bedding won’t trigger any unpleasant effects. The company making this type of bedding has a long-standing reputation in making excellent pet-oriented products. The Kaytee Clean & Cozy Colored is yet another proof of the manufacturer’s dedication to high standards; its absorbency rate is six times its weight, so you will be much pleased with how much you get for the money. If you prefer this colored version, don’t be surprised to have your kids interested in taking care of the family’s hamster and even cleaning the cage. And that’s only one of the many benefits offered by this product. You can depend on the excellent odor control offered by this bedding that is made to absorb all the nasty smells. Since it is 99.9% dust-free, it is a good option for people with allergies, and you won’t experience any troubles when changing the bedding. A high absorbency rate makes it popular with rodent owners; this bedding can retain as much as 4 to 6 times its weight in liquid. The fun colors offered by the manufacturer might stimulate your children to get more involved in looking after the family’s pet, and especially cleaning the cage. Comfort matters to hamsters and this type of bedding allows them to burrow or nest, for increased wellbeing. Some pet owners comment on the fact that the fluffy content is a bit inferior to other components, which makes the bedding not as absorbent as they would have liked. Do you want a type of bedding for your hamsters’ cage that retains moisture and smell, and also offers extra comfort to the little critters? Then you cannot go wrong with the Carefresh Confetti Small which is made with the wellbeing of pet rodents in mind. As the owner, you will also be pleased with the extra benefits and quality of this hamster bedding. This Carefresh hamster bedding is exceptionally fluffy and cozy, so don’t be surprised to see your pet burrowing in it or nesting with a lot of enthusiasm. Compared to wood shavings, it can retain twice the liquid, so it is more efficient. Plus, it has excellent odor control so that you don’t have to worry about nasty smells coming out of your pet’s cage. The low quantity of dust generated by this bedding makes cleaning and changing it a breeze, and people with allergies won’t have to worry about a thing. Keep your pet hamster happy and comfortable, by appointing his or her cage with this type of fluffy bedding that offers extra coziness. No nasty smells will come off the pet’s cage for days on end, as the superior odor control of this type of bedding will work its magic. Forget about wood shavings; this bedding retains twice the moisture and makes for a much better alternative, by being extra safe, too. Don’t worry about dust and whatnot when cleaning your pet’s cage, as this bedding will not trigger your allergies or make a mess. Last, but not least, its colorful appearance might determine your kids to help out a little more with cleaning the pet’s cage. The bedding seems to fill up quickly, and that means that you will end up changing it more often than usual, according to some buyers. The active action of this bedding for hamsters and other rodents will retain liquid and odors, helping you maintain a clean and healthy environment for your pets and not only. Your family will also benefit from keeping your hamsters’ cage free of nasty smells and piles of waste. Cleaning is a breeze, and overall, the performance of this bedding will convince you of its benefits. As far as moisture retention goes, the bedding can absorb three times its weight in liquid, so you will find it to be quite useful. The colorful design will make your pets’ cage appear livelier, and your kids will like it, too. Friendly to your pets and the environment, this natural bedding is an excellent option if safety is the number one priority for you. The brand is sold in 10-liter bags, and the content expands to two times this quantity, which makes it a pretty good deal. One of the most important benefits of this bedding is the superior odor control that won’t allow any unpleasant smells to come off the pets’ cage. The colorful confetti like design makes it fun and appealing for pets, and also for children who may want to give a helping hand with cleaning. Able to absorb three times its weight in moisture, the bedding is a good option for people who raise multiple pets in the same cage. Eco-friendly and natural, it is an option to consider if you want to make sure that your pet hamsters are not exposed to any unsafe compounds and chemicals. You will get a pretty decent deal, seeing how the content of the bag you’ll receive expands two times. While it appears to offer good odor control, it doesn’t look to do the same good job to absorb liquids, a few customers mention in their reviews. If you are looking for a type of bedding for your hamster that is particularly fluffy and cozy, this particular product may be right up your alley. First of all, it is made from paper and shavings, and it is soft and comfortable. Your pet will have a field day burrowing and nesting in it, to his or her heart’s content. For five days in a row, you won’t need to change the bedding completely, for the simple fact that the odor control is outstanding. Also, if you are to compare this product with wood shavings, here is what you need to know: this brand is capable of absorbing 60% more moisture, so it is a superior choice. When it comes to cleaning, there is also nothing to worry about. Since it is low in dust content, the bedding won’t make a mess and won’t be bad for your allergies, either. A combination of fluffy paper shreds and shavings, this bedding ensures a comfortable environment for your pet hamsters, gerbils, or other small rodents. Odor control is superior in this particular bedding, as it can keep bad smells at bay for up to five days straight. Due to the content of paper, this bedding is 60% more efficient in absorbing liquid than if it were made from shavings and nothing else. Pet owners are pleased that this bedding doesn’t generate dust, thus ensuring that the cleaning process is a breeze and not a source of allergies, either. Your pet will feel dry and warm all the time, which is essential for his or her wellbeing, and healthy development in the long run. Odor control, while it does exist, leaves something to be desired, according to a few of the hamster owners who have tried it. Are you looking for a type of bedding that is ideal for small rodents kept as pets? The Small Pet Select Premium Soft ticks all the right boxes and can offer you the possibility to create a more comfortable environment for your hamster, guinea pig, or rabbit. Your peace of mind is assured by the fact that this bedding is made in the US, and, besides abiding by the highest standards for quality, it is also free of any additives and chemical compounds that could hurt your pet’s health. While it is comfortable and fluffy for a pet, it is also absorbent and can guarantee that your pet won’t suffer any unpleasant consequences such as being forced to sit for too long in an environment affected by moisture and nasty smells. The paper used for this bedding is unbleached and has never been printed. 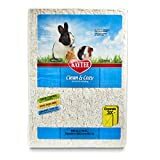 Use this bedding for any rodents, as it is suitable for rabbits, hamsters, and guinea pigs alike, by offering them good living conditions. Made in the US, this is an entirely safe product that does not come loaded with additives or other chemical based compounds like those made from recycled paper could. The product is made from unbleached paper, and it is worth noting that the used material was never printed, to avoid chemical residues that can affect a pet’s health. From the size it comes in, the product expands three times, which means that you get plenty of bedding to use for your hamster’s cage. Your pets will find the bedding to be pretty comfortable so that they will have no issues adapting to it. There appear to be some issues with the absorption capacity of this bedding, and some pet owners say they will look up other brands, or use this one in combination with others. The first thing you should know about this bedding is that it has excellent odor control since it is capable of keeping nasty smells at bay for up to 14 days without fail. That is the type of performance that is not easy to equal by just any other brand and a major selling point for this one. You will notice that the bedding is made from soft crumbles that can absorb three times their weight in liquid. The material used is recycled paper, but it is free of any toxins, and also unbleached. Another thing you may like to hear about this product is that it is eco-friendly. Not only your little furry friends will benefit from it, but you as well since you won’t spend a lot of time cleaning their cage. It must be mentioned that the product is made in the US, thus up to high standards of quality. The most significant benefit of this bedding for hamsters is the outstanding odor control that can last up to 14 days. Made from recycled paper, the bedding is eco-friendly, and also free of bleach, other toxic compounds, and substances that could make your pet sick. As a general rule, the bedding will keep inside the cage and won’t cause a mess, thus reducing the number of times you have to clean around. Because it is made in the US, you can expect certain quality standards that will assure you that this is the type of bedding for your pet. You will spend less time cleaning after your pet and more time bonding with him or her, as the low maintenance of this type of bedding helps. There seems to be quite a lot of dust, so people with allergies should be aware of this aspect when they manipulate the bag. Kaytee is a well-known name in the pet-oriented industry, and there’s no wonder, so many of its products end up in the top tier of consumers’ preferences. This hamster bedding for sale is the ideal pick for someone who wants to ensure that their pets are well cared for, and can thrive in an environment that is free of toxic and dangerous compounds. This product is made from FDA-approved materials, so you don’t have to worry about the safety of your pet. Another critical aspect that must be mentioned is the fact that it is 99.9% dust-free, something that people who suffer from allergies can surely appreciate. Because it is excellent at absorbing liquids, the product offers superior odor control, as well. Compared to wood shavings, it provides twice the absorbency rate, which is, in itself, a reason to prefer this kind of bedding. Small pets can benefit greatly from the extra comfort offered by this fluffy bedding that was created by its manufacturer with their needs in mind. You can rest assured that nasty smells won’t be an issue, as the bedding will do a great job at retaining them for a long time. If you were to compare this bedding to wood shavings, you would notice the higher liquid absorbency power. There will be no dust to worry about when you are changing the bedding since the product is made to limit mess and other problems. It is worth noting that the material used for making this bedding meets the FDA standards for safety. Most customers praise this product for being excellent, but they do have a minor gripe, and that is that the product is a bit too expensive for their budgets. Keep your pets’ cage smelling fresh for days on end without changing the bedding frequently, by using this product. The comfortable fluff that makes the most of this bedding ensures that your hamsters will have a great time burrowing and nesting in it. Since the primary purpose of bedding, however, is to absorb waste, it is essential to know that the odor control of this product is superior. The manufacturer advertises 10-day odor control for the Carefresh Complete Ultra, which is pretty impressive, seeing how not many other products on the market can brag about being able to do the same. Wood shavings can never be this good, especially since this bedding can retain twice the amount of liquid they are capable of absorbing. The low dust content will make cleaning and changing the bedding more comfortable, something to bear in mind if you have allergies and you’re looking for a specific type of product. Comfortable and fluffy, this bedding will provide your pets with the type of environment they can thrive in and be happy and active all the time. The 10-day odor control capabilities qualify it for a shortlist of products that you should invest in if you want a superior quality all around. Compared to wood shavings, it provides twice the absorbency rate, so there will be no issues with piles of waste and spills ruining your pets’ environment. You won’t have to worry about dust, either, as the bedding produces very low quantities; people with allergies will appreciate this. Designed for small pets, it can cater to the specific needs of animals like hamsters, guinea pigs, gerbils, and other rodents. There are very few complaints about this product, and one of them is that this product doesn’t appear to expand very well, which makes it a bit expensive. If you’re interested in getting the best bedding for hamsters available, you’ve come to the right place. We are here to help you find the product that fits your needs best, by providing you with a list of characteristics that the proper bedding for your pet should have. Since hamsters love to burrow and nest in the bedding placed in their cage, you need to make sure that you pick the right thing. What materials should be used for hamster bedding? The first thing you will notice when you’re checking the manufacturers’ descriptions of such products is an indication regarding the type of material used. What you will want to see there is a list of materials that are FDA-approved, to make sure that your hamsters aren’t exposed accidentally to toxic compounds. Paper is often used, as well as other natural materials, like hemp. If you pick a type based on paper, make sure that the manufacturer only uses the unbleached, non-printed variety. Even if it is recycled paper and not virgin fiber, you should make sure that the same rules apply. Just this way you can be sure that the environment you’re building for your hamster is free of any toxic compounds. In case you want to be completely safe, you can opt for some DIY hamster bedding ideas. If you are in complete control of what is used for making this product to be used inside your hamsters’ cage, you won’t have to worry about chemical compounds ending up there. What materials should be avoided? Certain materials should never be included on the list of ingredients for bedding used for rodents’ cages. For instance, even if some stores sell pine bedding for hamsters, that might not be the most indicated idea. Why? First of all, wood shavings obtained from pine or cedar can split into sharp fragments that, in turn, can hurt your pets. Some brands do carry safe options, such as the Aspen bedding for hamsters sold by some pet stores, but it is always highly recommended to read carefully the reviews left by buyers, to see if the respective products are indeed, a good option for your pet. Artificial materials that have as main role to offer a fluffy environment for your pet can be particularly dangerous as they don’t provide proper ventilation and can cause overheating in your hamsters. Don’t opt for cat litter as an option, as this contains large pieces that could be accidentally ingested by hamsters with terrible consequences. Sawdust should not be an option as it can trigger allergies in humans. Another no-no option is corn cob, as it can get moldy and become the ideal environment for bacteria. Leave aside recycled newspaper options, as these abound in toxic compounds that can hurt your pet’s health. Other aspects that you should bear in mind when you’re shopping for hamster bedding are odor control and absorbency rate. You will want a product that can absorb nasty smells and moisture rather well. That is why cheap hamster bedding might not cut it for you, although there are some decently priced alternatives to consider. Manufacturers will often be clear about the odor-control capabilities available, by telling you for how many days unpleasant smells will be kept in check. Such capabilities work hand in hand with a superior absorbency rate, so make sure that you check the entire description of each product you examine. There are benefits for you, as the owner, too. For instance, if the bedding you want to purchase absorbs moisture well, and there are no nasty scents to worry about, you will not have to change it as often or clean the entire cage. That can save you both time and money. Also, it will create the conditions for you to bond with your pet, instead of traumatizing him or her by moving him or her out of the cage too often. Don’t forget that rodents can be quite sensitive pets and that is why you must pay extra attention to ensuring extra comfort for them. Whether you choose dwarf hamster bedding or any other type for small rodents, make sure that some conditions are met, such as those for comfort. The bedding should be fluffy enough to allow the pet to burrow and nest in it, as he or she would typically do in the wild. This will create the best conditions for your pet to thrive and develop healthily.